The Poles started as a project in my spare time. I was going to simple paint up some Syrian/Egyptian infantry from the Battlefront Arab-Israeli Wars Fate of a Nation range in green as Poles and fielding them using Volksarmee. Then I thought, why don’t I just make their own briefing. 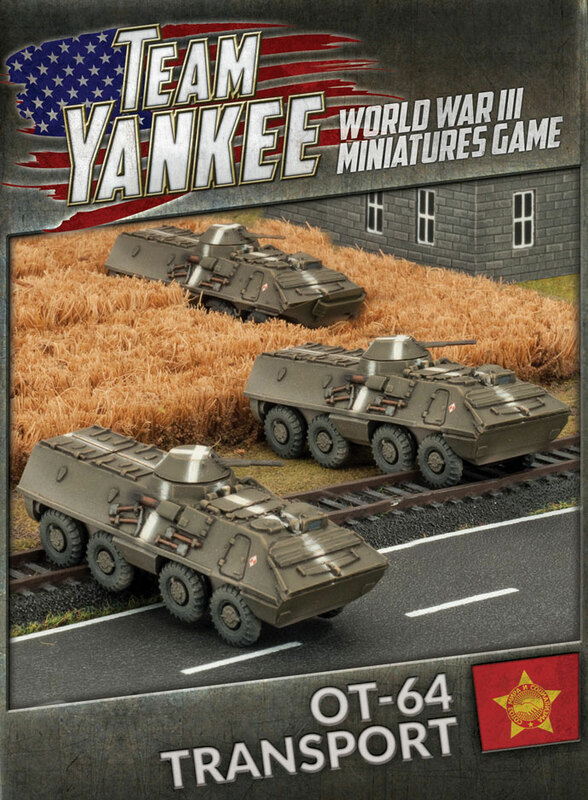 I also had been noticing a real desire among the Team Yankee community to see more Warsaw Pact representation on the tabletop. So began the idea of publishing these in some form. One of the main differences between the Poles and the Soviets or East Germans are their ratings. Poles have Courage 3+, Morale 4+, Rally 3+, Skill 4+, Assault 5+ and Counterattack 3+. This gives them better Skill than the Soviets, with a similar Rally and Counterattack, giving them plenty of go forward. For the Poles we wanted to represent the frontline divisions that were likely to reinforce the advance of the Soviets and East Germans that would push into the North German Plain. The intelligence briefing contain four formations and support. You can take T-72M and T-55AM2 Tank Battalions, BMP and Wheeled Motor Rifle Battalions. One advantage we had was that much of the models already made for the Soviets and East Germans can also be used for the Poles. The plastic T-72 kit is used for the T-72M, as we have already done for the East German Volksarmee, the main differences being internal. The T-72M tank’s 125mm main gun rated anti-tank 21, firepower 2+, with Brutal, Laser Rangefinder, and a Stabiliser, when combined with its good armour of Front 15, Side 9, Top 2 and Bazooka Skirts (Side 10 against HEAT) make it a formidable war-machine. The new plastic T-55 kit also contains all the parts to make the T-55AM2, or the Polish variant known as the T-55AM Merida. ‘Merida’ being the Polish designed fire control system. This modernised T-55 tank’s gun has anti-tank 17 and firepower 2+, and is fitted with a Laser Rangefinder. It has an improved armour package with Front 14, Side 9, Top 2 and Bazooka Skirts (Side 10 against HEAT). Each of these tank battalions, in the Soviet style, can have its own scouts, anti-aircraft, artillery and motor infantry as part of their formation, making them truly combined arms forces. Like the Soviets and East Germans, the Poles also mounted infantry in BMP infantry fighting vehicles. Like the East Germans only limited numbers of BMP-2 were available so the majority of the IFVs are BMP-1s. The Wheeled Motor Rifle Battalion allows the Poles to field the riflemen mounted in the 8x8 OT-64 Transport, or SKOT-2A as the Poles called it. This Czechoslovak design was used instead of the Soviet BTR-60. However, if players wish we have given an option to field them mounted in BTR-60s representing truck-borne troops being remounted by the Soviets. The OT-64 model has been made especially for the release of the Poles and Czechoslovaks. Like the tanks, both motor rifle formations are combined arms battalions with their own scouts, anti-aircraft, anti-tank, artillery and tank units. The Polish support includes another unique model in the form of the DANA SP 152mm. This very cool looking model is a wheeled 8x8 self-propelled howitzer with a fully automatic loading system. We have given it the Autoloader rule, reducing the score required To Hit Teams under the Template by 1. 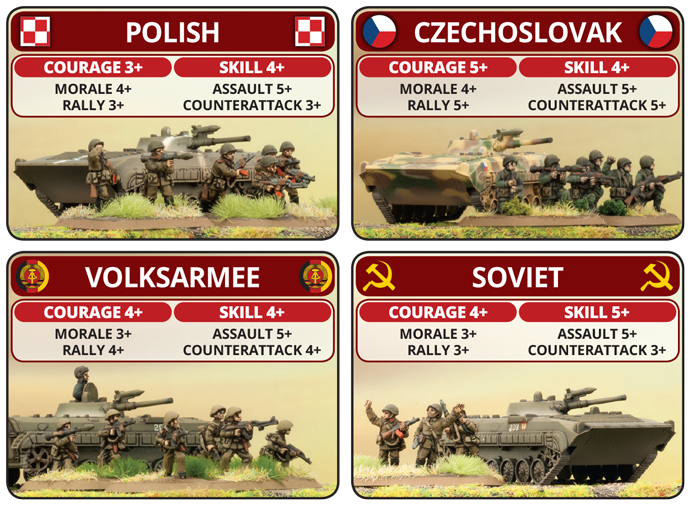 The booklet will come with a pack of Polish Unit cards much like West German Panzertruppen and Soviet Afgantsy booklets in the past. 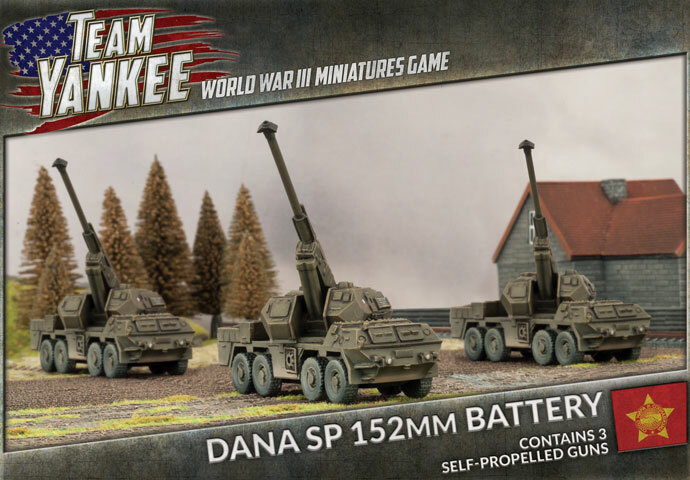 As mentioned above we have two new models to go with the Poles, the OT-64 armoured personnel carrier and the DANA 152mm SP Howitzer. 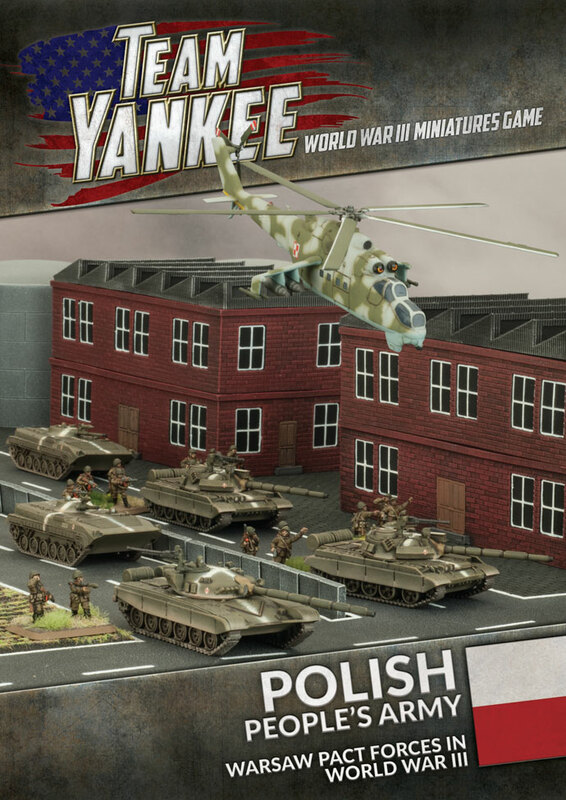 Other models used for the Poles come from the Soviet Team Yankee range and the booklet comes with a catalogue of products for easy reference. It is worth mentioning that though we recommend using the Soviet infantry range to represent your Polish infantry, you could also us the Syrian and Egyptian infantry from the Fate Of A Nation miniatures range, which is something I plan to do to represent the Poles in lighter summer kit.